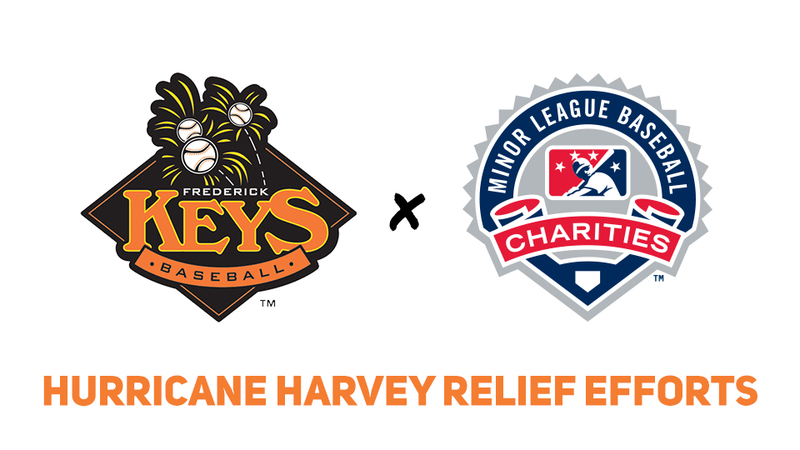 FREDERICK, MD -Over the final week of the season, the Frederick Keys will be raising monies for the victims in Houston and southeast Texas affected by Hurricane Harvey. The team will donate all money raised from its Wheel of Fun on Tuesday, Wednesday and Monday, along with proceeds raised from Monday's 50-50 raffle. To go along with the help from Keys fans, all Keys player fine money will go towards the relief efforts. All the money raised will then be doubled by the Keys. "Our hearts go out to everyone in Houston and the affected areas," said Keys General Manager Dave Ziedelis. "We are asking all of our fans to help us out in raising money for the victims and to assist in whatever way possible with the relief efforts." The Keys will also be sending shirts and other clothes to help families ravaged by the flooding. To go along with support from the Keys, Minor League Baseball Charities will match donations provided by its teams up to $10,000. All funds raised by MiLB teams will then be sent by to organizations selected by Minor League Baseball to help those affected. On Wednesday, the Keys continue their three-game series with the Salem Red Sox. Right-hander Cristian Alvarado (7-9, 5.20) starts for the Keys and will be opposed by Red Sox left-hander Kyle Hart (2-2, 2.87). First pitch is slated for 7:00 p.m from Nymeo Field and the broadcast can be heard on 1450 AM The Source, frederickkeys.com and the TuneIn Radio App. Homestand highlights include Art in the Park Night, the annual Guns and Hoses softball game presented by Berman, Sobin, Gross, Feldman and Darby LLP, two Trolls picnics and Fan Appreciation Day. For tickets fans can call the Keys at 301-815-9939 or visit frederickkeys.com.